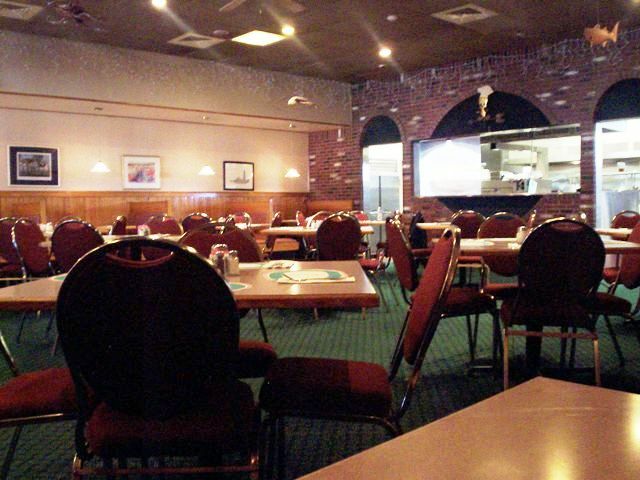 We decided to end our Bristol eat-a-thon with a very popular restaurant. 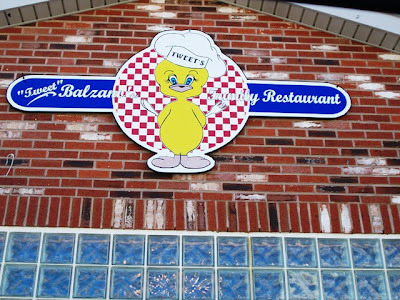 On a very cold Saturday afternoon, we found ourselves parking in Tweet Balzano's empty parking lot at 3 p.m. They were just about to open for the day, hence the emptiness. We got a great parking spot, though. As we were just sitting in the car talking, a waitress was motioning us to "come on in". I thought maybe she thought that we didn't know they were open. Laura thought she was being pushy, but I think I was right. Anyway, we ambled on in and were quickly seated. We've been coming to Tweet's since my kids were small. As a matter of fact, Mallory (who is now 25) was a great source of amusement to other diners when she took the empty clam shells from her father's plate and clicked them high above her head. "Look at the baby," was the cry around the dining room. Good times. The place has changed quite a bit since then. They had a fire which closed the place for quite awhile, but their patrons were thrilled when they reopened. After all, they've been in business for over 50 years and are an institution in Bristol. We were seated in a booth in a dining room that also had tables. The tables were nicely set and people started trickling in. Our waitress Jayne approached with menus and took our drink order for two Diet Pepsis. Everything looked good and I noticed that they seem to carry a lot more seafood than I remember. There are more seafood dishes than Italian ones, it seems. Jayne returned quickly with our sodas and some Italian bread with butter. Yeah, butter - not dipping oil, for a change. The bread was nice and soft, but not particularly flavorful. We told Jayne we'd start with an order of mozzarella sticks. 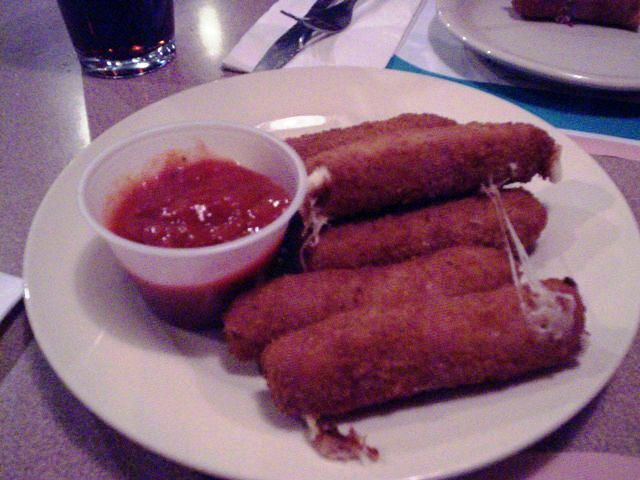 These mozzarella sticks were a thing of beauty. They were large, filled with cheese and came seven to an order. They had a nice crunchy outside and were cooked perfectly. The only downside was that the cup of marinara along side was cold. I love when the accompanying sauce is nice and hot. It just goes better with the hot sticks. They have a lot of appetizers here like littlenecks, calamari, shrimp, smelts and non-seafood items like potato skins, chicken tenders, meatballs and so much more. You'll have trouble deciding. We had trouble deciding on our entrees but finally gave Jayne our orders. 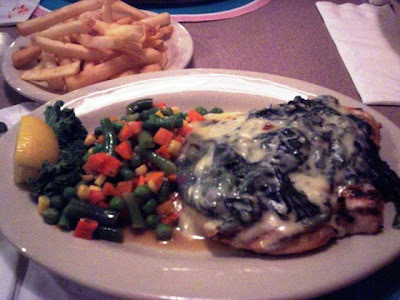 Laura decided on the chicken Florentine which was a large chicken breast covered with sauteed spinach and pepper cheese. It came with a salad (she got blue cheese dressing), a medley of mixed veggies and given a choice of potato or pasta, she chose fries. When it arrived we had to note that Tweet's certainly wasn't skimpy. This was one full plate ... only Laura wished it had tasted better. Her chicken was very dry and she couldn't cut it with her knife. The veggie medley looked like it came out of a bag of frozen mixed that you get at the market. The fries were OK but lacked any seasoning - not even salt - which made them very bland. The salad, however, was great. It was fresh with lots of veggies and the dressing was tasty. She wished the chicken tasted as fresh. I ordered the chicken cutlet parmigiana with spaghetti. It came with a salad and I got French dressing for it. Like Laura's salad, mine was fresh and crisp and the dressing creamy and sweet. This was a great little salad. My entree was as large as Laura's had been. 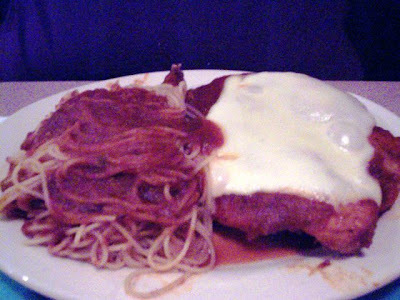 A large chicken breast covered in sauce with a square of mozzarella melting on top. It was funny to see the shape of the cheese on top of the chicken. The sauce on my spaghetti was dark (very dark), almost black. I think I know why. This didn't taste like fresh sauce. It tasted like sauce that had been cooked way too long and had reduced far too much. It was heavy, bitter and had a burned aftertaste. I think I got the bottom of last night's pot. At least it tasted that way. Not good. I prefer a nice, fresh, light-tasting tomato sauce that doesn't overpower the pasta. Plus, my chicken had the same problem Laura's did - way too dry. I also couldn't cut it and it gave me the impression that this chicken was not freshly cooked when we ordered it. Again I think this was yesterday's chicken, heated up and then served. There was no moistness to it at all. Very disappointing. Neither Laura nor I ate much of our meals and you know us, we don't like to waste. What happened Tweet's? I remember the food being so much better than what we were served yesterday. I know restaurants have to cut costs and save money but please, not with the food. The pastas and sauces should be made fresh daily. Please don't reheat meats. Chicken, meatballs, etc., do not taste better the next day. They taste old and dried up. 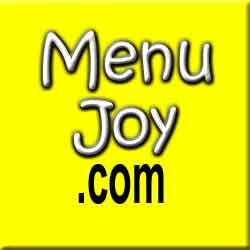 Tweet's has an extensive menu of seafoods like shrimp, scallops, swordfish, scrod, clams and mussel dishes. 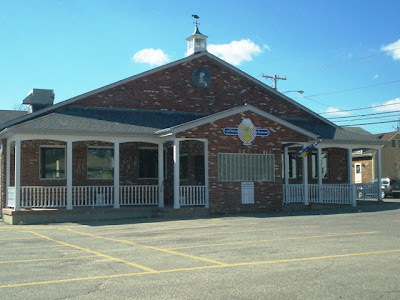 They also do a few steak, veal and chicken dishes. They do spaghetti by the pound and a couple of other pastas like ravioli, lasagna or manicotti. Plus you can get meatballs or sausages on the side. But mostly I'd say this is a seafood place as their menu is overwhelmingly seafaring. I hope the seafood dishes are fresher than the landlubber meals we were served. As for service, it was generally great. However, we were not offered refills on our drinks. When Laura asked for change, the waitress scooted off before we could tell her exactly what we wanted. THE VERDICT: I don't think we'd rush back to Tweet's and I never thought I'd say that. With a 20% tip for Jayne, it came to $44. However, minus the $10 gift certificate from we had from MenuJoy.com, we only paid $34. We checked out the ladies' room and were surprised to find the trash cans full since the restaurant just opened. Generally though, it was clean. Tweet Balzano's is open from 4-9 p.m. Monday through Thursday, 3-10 p.m. Friday and Saturday, and 12-9 p.m. Sunday.